The third season of True Detective, an American anthology crime drama television series created by Nic Pizzolatto, was confirmed by HBO on August 31, 2017, and premiered on January 13, 2019. The story takes place in the Ozarks over three separate time periods, as partner detectives investigate a macabre crime involving two missing children. The opening theme of the season is the song "Death Letter" written by Son House and performed by Cassandra Wilson from her 1995 album New Moon Daughter. Mahershala Ali plays the lead role of detective Wayne Hays, while Stephen Dorff plays his partner detective Roland West. The season marks Pizzolatto's directorial debut, with the series creator dividing up directing assignments with Jeremy Saulnier and Daniel Sackheim. Pizzolatto also serves as the showrunner and sole writer of the season, with the exception of the fourth and sixth episode, which he co-wrote with David Milch and Graham Gordy respectively. The third season of True Detective, an American anthology crime drama television series created by Nic Pizzolatto, was confirmed by HBO on August 31, 2017, and premiered on January 13, 2019. The story takes place in the Ozarks over three separate time periods, as partner detectives investigate a macabre crime involving two missing children. The opening theme of the season is the song "Death Letter" written by Son House and performed by Cassandra Wilson from her 1995 album New Moon Daughter. In November 2015, a few months after the conclusion of the second season, HBO reached an overall deal through 2018 with series creator and executive producer Nic Pizzolatto, that called for him to develop a number of new projects, that could include a third season of True Detective. Talking about the deal, the president of HBO programming Michael Lombardo stated, "I am thrilled to continue our relationship with Nic, as he is one of the most exceptionally talented writers and producers working today. I look forward to seeing where his unique creative vision will take us next." In regard to a potential third season, Variety reported that the network had requested some changes that included Pizzolatto working with a staff of writers or possibly having a new showrunner. These changes would address the issue of the second season being received less favorably than the first, which was in part attributed to the lack of a creative counterpart to Pizzolatto. In the first season, strong artistic input from Cary Joji Fukunaga, who had directed all eight episodes, is said to have benefited the show. However, with the second season enlisting multiple directors, Pizzolatto had wielded more creative control, conceiving and executing the season on his own. In June 2015, in an interview with Vanity Fair, Pizzolatto had stated, "If I'm making a movie or a show or whatever, I'm expressing something on a personal level or else it doesn't mean anything to me. If I'm doing that, it works better without a committee." David Milch was involved in the writing process of the anthology's third season. In July 2016, Casey Bloys, who had succeeded Lombardo as HBO head of programming two months earlier, confirmed plans for a third season, describing True Detective as "a valuable franchise" and revealing that both the network and creator Pizzolatto were open to another season. In March 2017, it was revealed that David Milch had been recruited to assist Pizzolatto in preparing the third season, and that writing the first two episodes had already been completed. In June 2017, The Tracking Board reported that Mahershala Ali was in early discussions with HBO to play the lead role of the season. In July 2017, Bloys told reporters at the press tour of the Television Critics Association that Pizzolatto had written the third season almost in its entirety, and added "When we find a director, we'll be a go on that." On August 31, 2017, after director Jeremy Saulnier was confirmed to work alongside Pizzolatto, HBO officially greenlit the third season of True Detective. The story was announced to span three decades and take place in the Ozarks, as partner detectives investigate a macabre crime, with Ali in the lead role of state police detective Wayne Hays. Talking about the renewal, Bloys stated: "Nic has written truly remarkable scripts. With his ambitious vision and Mahershala Ali and Jeremy Saulnier aboard, we are excited to embark on the next installment of True Detective." Besides Pizzolatto, who also serves as the season's showrunner, other executive producers of the season include Saulnier, Fukunaga, Scott Stephens, season one stars Woody Harrelson and Matthew McConaughey, along with Steve Golin, Bard Dorros, and Richard Brown. Saulnier was expected to direct the first three episodes of the season. However, in March 2018, after he had completed the first two episodes, Saulnier exited the series due to scheduling conflicts, though multiple sources reported "differences of opinion" with Pizzolatto. Daniel Sackheim was announced to replace Saulnier, with the veteran director also being added as an executive producer for the season. Sackheim would divide up directing assignments on the remaining episodes with Pizzolatto, who also serves as the sole writer of the season, except for the episodes four and six, which he co-wrote with David Milch and Graham Gordy respectively. Following other critically acclaimed actors who had starred in the first two seasons of the series, Academy Award-winner Mahershala Ali plays the lead role of state police detective Wayne Hays. In an interview with Variety, Ali revealed that he was originally offered a supporting role, as the main character was supposed to be white. However, pursuing a better choice for his career, he convinced Pizzolatto that he was suited for the lead. In November 2017, Carmen Ejogo was announced to star alongside Ali, in the role of schoolteacher Amelia Reardon, and in January 2018, Stephen Dorff was announced to play the co-lead role of partner detective Roland West. Joining them in a series regular role, Ray Fisher plays Wayne Hays' son Henry, while the season also includes a number of recurring roles. In January 2018, The Agency Inc. issued casting calls for up to 1,500 actors, stand-ins and photo-doubles to begin filming in Northwest Arkansas, with the agency's CEO noting, "This is the largest production we’ve ever cast." Additional casting calls were issued in June 2018 on Backstage, for Asian talent to portray Vietnamese civilians and soldiers. A view of Mount Sequoyah from the campus of the University of Arkansas in Fayetteville. In February 2018, filming began in Arkansas, with Jeremy Saulnier and Nic Pizzolatto splitting directing assignments. However, Saulnier exited the production early, after he had directed the first two episodes of the season, as it had become clear that filming would take longer than expected to complete. On March 30, 2018, in addition to reports on scheduling conflicts, Variety wrote in regard to Saulnier's departure: "Sources said the filming on location in Arkansas has been tough at times, and that Pizzolatto and Saulnier had differences of opinion on the episodes." Saulnier was replaced by veteran director Daniel Sackheim, who would also divide directing assignments on the remaining six episodes with Pizzolatto. The season was filmed by Random Productions LLC at various locations throughout Northwest Arkansas, including Fayetteville, Bentonville, Lincoln, Rogers and Springdale. Filming took place mainly in Fayetteville, from Mount Sequoyah to homes, apartments and restaurants around the city. Filming on location also included the use of stunts and pyrotechnics in residential areas, namely car explosions, smoke and loud noises. In regard to production on the series taking place in Arkansas, the director of Arkansas Economic Development Commission had stated in December 2017, "This is the largest and most expensive production we've ever had in the state. With an estimated year from start to finish, we know that local businesses and vendors will enjoy a boon from the production." The season wrapped filming in Fayetteville in August 2018. Talking about their experience, executive producer Scott Stephens said, "Everything we've needed has been right at our fingertips, from period architecture to abandoned buildings that still evoke the 80s," while lead actor Mahershala Ali added that "[the landscape] is such a character in the story. It would have been such a shame if we had shot it any other place." Pizzolatto, who spent four years of his life in Fayetteville as a student at the University of Arkansas, found the area evocative and powerful, and revealed that it was important for him to shoot the season in Arkansas, as this was the place he had in mind when he was writing the episodes. Mahershala Ali (left) plays the lead role in the third season, accompanied by Stephen Dorff (middle) and Carmen Ejogo (right). The third season has received positive reviews, and has been praised as a return to form in comparison to the mixed reception of the second season. On Rotten Tomatoes, the season has a rating of 86%, based on 76 reviews, with an average rating of 7.39/10. 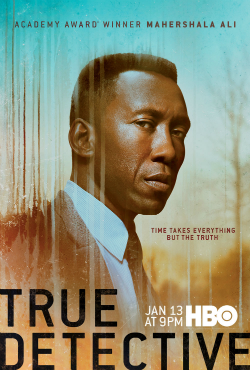 The site's critical consensus reads, "Driven by Mahershala Ali's mesmerizing performance, True Detective's third season finds fresh perspective by exploring real-world events – though it loses some of the series' intriguing strangeness along the way." On Metacritic, the season has a score of 71 out of 100, based on 32 critics, indicating "generally favorable reviews". ↑ Coates, Tyler (January 14, 2019). "'True Detective' Season 3's Theme Song Sets the Eerie Tone for the Mystery Series". Esquire. Retrieved January 17, 2019. 1 2 Chitwood, Adam (November 17, 2015). "'True Detective' Creator Nic Pizzolatto Inks Deal with HBO, But No Season 3 Order Yet". Collider. Archived from the original on September 20, 2018. Retrieved September 19, 2018. 1 2 Wagmeister, Elizabeth (November 17, 2015). "'True Detective' Season 3 Still Up in the Air as HBO Inks Deal with Nic Pizzolatto Through 2018". Variety. Archived from the original on September 20, 2018. Retrieved September 19, 2018. ↑ Robinson, Joanna (November 17, 2015). "True Detective May Get a Third Season But HBO Has Some Demands for Creator Nic Pizzolatto". Vanity Fair. Archived from the original on July 4, 2017. Retrieved September 19, 2018. ↑ Meslow, Scott (August 10, 2016). "How to Fix 'True Detective'". GQ. Archived from the original on September 20, 2018. Retrieved September 20, 2018. ↑ Cohen, Rich (June 11, 2015). "Can Nic Pizzolatto, True Detective's Uncompromising Auteur, Do It All Again?". Vanity Fair. Archived from the original on November 23, 2017. Retrieved September 19, 2018. ↑ Andreeva, Nellie (May 23, 2016). "HBO: Casey Bloys To Succeed Michael Lombardo As President of Programming". Deadline. Archived from the original on September 19, 2018. Retrieved September 19, 2018. ↑ Hibberd, James (July 30, 2016). "True Detective season 3 might still happen". Entertainment Weekly. Archived from the original on July 31, 2016. Retrieved August 1, 2016. ↑ Hibberd, James (March 27, 2017). "True Detective season 3 revived, David Milch joins team". Entertainment Weekly. Archived from the original on March 27, 2017. Retrieved March 27, 2017. ↑ Sneider, Jeff (July 1, 2017). "Mahershala Ali to Star in "True Detective" Season 3 (Exclusive)". The Tracking Board. Archived from the original on September 20, 2018. Retrieved September 19, 2018. ↑ O'Connell, Michael (July 26, 2017). "HBO Boss Offers Updates on 'True Detective,' 'Deadwood' and His Broad Drama Push". The Hollywood Reporter. Archived from the original on September 20, 2018. Retrieved September 19, 2018. ↑ Goldberg, Lesley (August 31, 2017). "'True Detective' Season 3 Officially a Go at HBO". The Hollywood Reporter. Archived from the original on August 31, 2018. Retrieved August 31, 2018. ↑ Fitzpatrick, Kevin (April 2, 2018). "'True Detective' Season 3 Director Clashed With Nic Pizzolatto". ScreenCrush. Archived from the original on September 20, 2018. Retrieved September 20, 2018. ↑ Barfield, Charles (April 2, 2018). "Director Jeremy Saulnier Leaves 'True Detective' After Friction With Series Creator Nic Pizzolatto". The Playlist. Archived from the original on September 20, 2018. Retrieved September 20, 2018. 1 2 Littleton, Cynthia (March 30, 2018). "'True Detective' Director Shuffle: Jeremy Saulnier Exits, Daniel Sackheim Signs On (EXCLUSIVE)". Variety. Archived from the original on March 31, 2018. Retrieved March 31, 2018. ↑ Cho, Stephan (December 12, 2018). "New Trailer for True Detective Season Three Brings the Ozarks into Focus". Paste. Retrieved December 13, 2018. ↑ Yang, Rachel (December 4, 2018). "Mahershala Ali's 'True Detective' Role Was Originally Written for a White Actor". Variety. Retrieved December 27, 2018. 1 2 Andreeva, Nellie (November 17, 2017). "'True Detective': Carmen Ejogo To Star In Season 3 Of HBO Anthology Series". Deadline Hollywood. Archived from the original on November 20, 2017. Retrieved November 18, 2017. ↑ Hoai-Tran Bui (January 3, 2018). "True Detective Season 3 Casts Stephen Dorff as Mahershala Ali's Partner". /Film. Archived from the original on September 20, 2018. Retrieved September 20, 2018. 1 2 3 4 5 Andreeva, Nellie (February 14, 2018). "'True Detective': Ray Fisher Joins Cast of HBO Anthology Series As Regular; Three More Set To Recur On Season 3". Deadline Hollywood. Archived from the original on February 15, 2018. Retrieved February 15, 2018. 1 2 "Arkansas talent agency issues casting call for HBO's "True Detective"". Arkansas Economic Development Commission. January 19, 2018. Archived from the original on September 21, 2018. Retrieved September 20, 2018. ↑ R.A Karthik Prasad (June 4, 2018). "True Detective Season 3 Casting Call Hints Plot Connection To Vietnam". PursueNews. Archived from the original on September 21, 2018. Retrieved September 20, 2018. ↑ Niv M. Sultan (January 3, 2018). "True Detective Season 3 Begins Filming in February". ScreenRant. Archived from the original on September 21, 2018. Retrieved September 21, 2018. ↑ Murphy, Kay (May 29, 2018). "'True Detective' Crew Teach Students and Staff About On-Site Film Production". University of Arkansas News. Archived from the original on September 21, 2018. Retrieved September 21, 2018. 1 2 Bartholomew, Dustin (August 14, 2018). "True Detective wraps filming; Creator, star discuss experience in Fayetteville". Fayetteville Flyer. Archived from the original on September 21, 2018. Retrieved September 21, 2018. ↑ Riddle, Brandon (April 3, 2018). "'True Detective' filming to include stunts, pyrotechnics in Fayetteville". Northwest Arkansas Democrat-Gazette. Archived from the original on September 21, 2018. Retrieved September 21, 2018. ↑ Schaefer, Sandy (August 16, 2018). "HBO's True Detective Season 3 Wraps Filming". ScreenRant. Archived from the original on August 17, 2018. Retrieved September 21, 2018. ↑ Kuester, Nate (August 18, 2018). "Inside Look at the "True Detective" TV Series Production in NWA". NWAHomepage.com. Archived from the original on September 21, 2018. Retrieved September 21, 2018. ↑ Birnbaum, Debra (August 31, 2017). "'True Detective' Season 3 Set at HBO Starring Mahershala Ali". Variety. Archived from the original on December 4, 2017. Retrieved August 31, 2017. ↑ Petski, Denise (January 3, 2018). "'True Detective': Stephen Dorff Cast In Season 3 Of HBO Anthology Series". Deadline Hollywood. Archived from the original on January 3, 2018. Retrieved January 3, 2018. ↑ Petski, Denise (January 16, 2018). "'True Detective': Scoot McNairy Cast In Season 3 Of HBO Anthology Series". Deadline Hollywood. Archived from the original on January 16, 2018. Retrieved January 16, 2018. ↑ Fitzpatrick, Kevin (February 14, 2018). "'Justice League' Star Ray Fisher Joins 'True Detective' Season 3". ScreenCrush. Archived from the original on April 26, 2018. Retrieved September 20, 2018. ↑ Zinski, Dan (February 6, 2018). "True Detective Season 3 Casts Mamie Gummer". ScreenRant. Archived from the original on September 20, 2018. Retrieved September 20, 2018. 1 2 3 Petski, Denise (May 8, 2018). "'True Detective': Josh Hopkins, Jodi Balfour Set To Recur In Season 3 Of HBO Series". Deadline Hollywood. Retrieved December 14, 2018. ↑ Petski, Denise (July 16, 2018). "'True Detective': Deborah Ayorinde To Recur In Season 3 Of HBO Series". Deadline. Archived from the original on September 20, 2018. Retrieved September 20, 2018. 1 2 Petski, Denise (February 20, 2018). "'True Detective': Sarah Gadon & Emily Nelson Set To Recur On Season 3 Of HBO Anthology Series". Deadline. Archived from the original on February 20, 2018. Retrieved February 20, 2018. 1 2 Petski, Denise (February 21, 2018). "'True Detective': Brandon Flynn & Michael Graziadei Set To Recur In Season 3 Of HBO Anthology Series". Deadline. Archived from the original on February 22, 2018. Retrieved February 21, 2018. 1 2 Metcalf, Mitch (January 15, 2019). "Updated: ShowBuzzDaily's Top 150 Sunday Cable Originals & Network Finals: 1.13.2019". Showbuzz Daily. Retrieved January 23, 2019. ↑ Metcalf, Mitch (January 23, 2019). "Updated: ShowBuzzDaily's Top 150 Sunday Cable Originals & Network Finals: 1.20.2019". Showbuzz Daily. Retrieved January 23, 2019. ↑ Metcalf, Mitch (February 5, 2019). "Updated: ShowBuzzDaily's Top 150 Sunday Cable Originals & Network Finals: 2.3.2019". Showbuzz Daily. Retrieved February 7, 2019. ↑ Metcalf, Mitch (February 12, 2019). "Updated: ShowBuzzDaily's Top 150 Sunday Cable Originals & Network Finals: 2.10.2019". Showbuzz Daily. Retrieved February 13, 2019. ↑ Metcalf, Mitch (February 20, 2019). "Updated: ShowBuzzDaily's Top 150 Sunday Cable Originals & Network Finals: 2.17.2019". Showbuzz Daily. Retrieved February 20, 2019. ↑ Metcalf, Mitch (February 26, 2019). "SHOWBUZZDAILY's Top 150 Sunday Cable Originals & Network Finals: 2.24.2019". Showbuzz Daily. Retrieved February 26, 2019. ↑ "True Detective: Season 3 (2019)". Rotten Tomatoes. Retrieved February 20, 2019.